Thanks for the speedy service, Austin Marathon! I wasn’t expecting it for a while.Once I get my shirt we’ll be square. 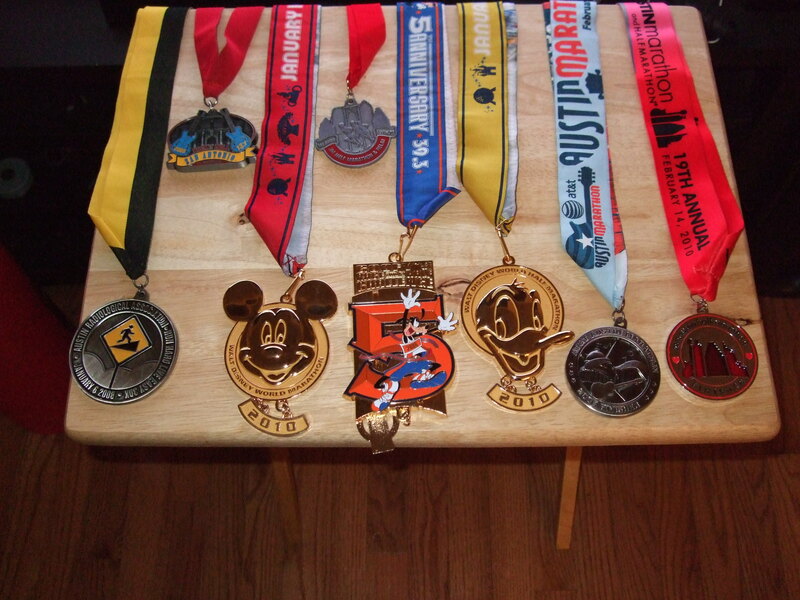 Here’s a picture of all my racing bling before I put it away. Sadly, I can’t have any personal items up for the open house so I have to pack these bad boys. 19 Feb	This entry was published on 19/02/2010 at 12:22 AM. It’s filed under Austin and tagged austin marathon, Marathon, marathon medals, race medals. Bookmark the permalink. Follow any comments here with the RSS feed for this post. What wonderful accomplishments, Melizza! I wish I enjoyed running. Thanks! Running and me have a love-hate relationship. I love finishing a run but I hate running it. Woo hoo! Glad you got it! I have ONE medal… but yeah I want some more too! Racing becomes very addicting! The medals add to that. You’ll have to add a London Marathon medal to that pile. That’s the plan. You need to get your passport so you can run it too!